- Tangled roots anchor this massive tree, as its branches soar heavenward, touching the stars. 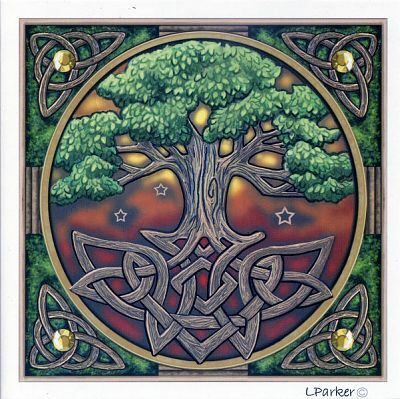 The Tree of Life stands as a bridge between worlds, and a connection between the visible world and the realm that lies just beyond our senses. Based on artwork by renowned fantasy artist Lisa Parker. Cards measure 5" square, and are blank on the inside so you can add your own message. Sold individually, with envelope. Do you have any other questions about our Tree of Life Greeting Card?